with the sharper visuals and superior performance you demand. Gray-Metal or plastic chassis – it's time to choose your weapon. *Product specifications may differ from country to country. products available in your country. and the marked WASD key group and dedicated numeric pad enable fast, full control. 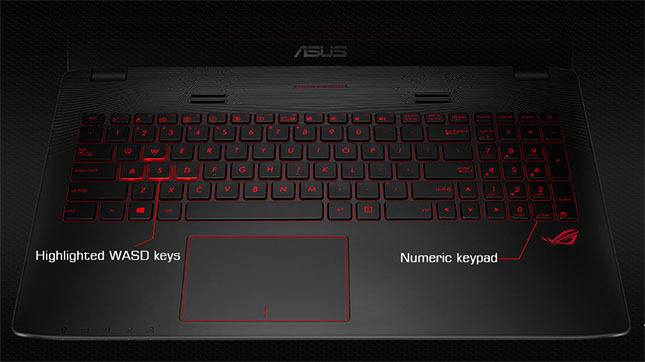 A solid, one-piece construction keyboard is illuminated by a ROG-red backlight for visibility at all times. options. The reversible Type-C port ensures a proper connection every time, right-side up, or upside down. With up to 2TB of hard drive storage and optional up to 256GB M.2 solid-state disk (SSD), GL552 has speed and storage in abundance. Store all you need, and fulfil your desire for speed. 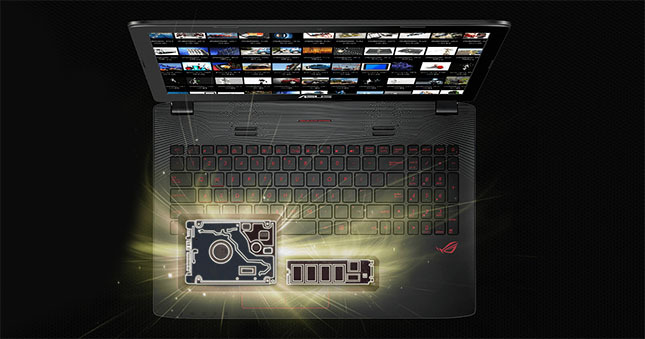 so fit an M.2 SSD, a bigger hard drive or more memory whenever you want. GameFirst III technology prioritizes the flow of game data across your network. Gaming is smoother, and lag is banished — so your frags are always put first. you'll enjoy full vivid-color glory from even the most extreme positions. popular game genres — immersing you in game worlds like never before.